While there may be more than a dozen multi-device wireless chargers technically available now, most do not charge both smart watches and smartphones – and most of the companies who make them could not actually provide units for review since they're bring offered through crowdfunding projects. As a result, we're limiting this review to multi-device chargers from three stalwart companies and a start-up that promptly shipped over a review unit. The Samsung Wireless Charger Duo impressed me from the moment I pulled it from the box. With a smooth, matte black finish and slick, curvy lines, this charger is aesthetically pleasing and feels well built. The two charging spots offer 7.5W "adaptive fast charging" as opposed to standard 5W charging. (Not all Qi-enabled smartphones support fast charging, but the Galaxy S9, Note9 and Apple iPhone 8 and newer do). Samsung, however, said Apple has a proprietary charging standard related to Qi, so Samsung's hardware can only charge compatible iPhones at the standard Qi output, 5W. While the Wireless Charger Duo will power up a Qi-enabled Android smartphone or iPhone, it only supports the Gear S3 or later Samsung Watches. So, you can charge either two Qi-enabled smartphones or a smart phone and a Samsung smartwatch at the same time. Note: The charging stand portion of the Wireless Charger Duo cannot be used for charging smart watches. Unlike most wireless chargers, this one has a built-in ventilation fan to keep devices cools as they're receiving power; it also uses a USB Type-C universal power cable. One thing to look for in a wireless charger is the ease with which you can position your device and still receive a charge. I've owned many wireless chargers and it's a real pain to have to reposition your phone for it to begin charging. That's not the case with the Samsung Wireless Charger Duo, which allows liberal movement around both the pad and stand. The Samsung charging dock is 8¼-in. by 3½-in. in size. The pad and stand have a rubberized coating to resist device slippage. One unusual feature are the two LED lights that not only tell you when your devices are charging, but when they're fully charged (red indicates charging, green means fully charged). Most chargers' LED simply tells you when a device is connected. While you may think it a superfluous feature, it isn't; you can instantly tell from across a room whether your device has finished charging. (A flashing red light indicates the device is not charging properly.) One issue: as this charger is built specifically for Samsung Android phones and smart watches, the LED light didn't show when my iPhone 8 was fully charged. 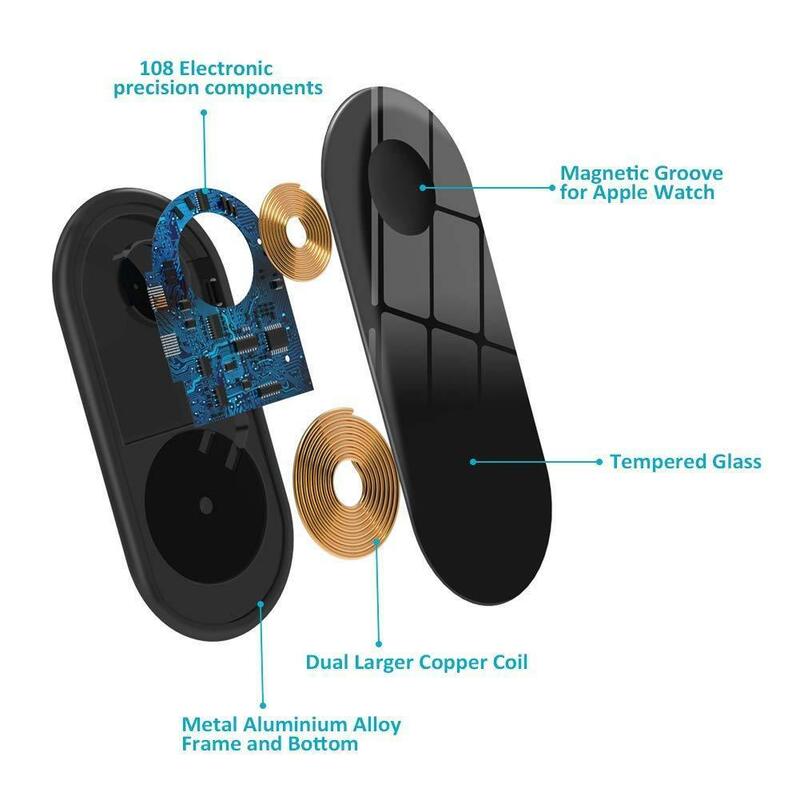 One concern I had with the Wireless Charger Duo is that it doesn't appear to have foreign object detection software, meaning if metal or an RFID tag (such as a credit card with chip) were in between the smartphone/watch and pad, the object could heat up and damage the device or render the RFID tag unusable. Foreign object detection is becoming more widely available on many of the latest wireless chargers, such as the Belkin BOOST↑UP wireless charging pad. Unfortunately, Belkin has yet to ship its multi-device wireless charger. Samsung, however, asserted that the Qi specification requires foreign object detection and since its charger is in compliance, it does include that protection. Overall, I found the Wireless Charger Duo to be a well-made, well-designed product. I really like the charging stand and the looks of this device, and because it's made by Samsung, it should prove to be reliable. Just in case, the charger does come with a one-year warranty. The Wireless Charger Duo will run you $113 on Amazon. The Zens Wireless Charger in action. While I initially asked Dutch electronics vendor Zens for its standard Dual-Watch Fast Wireless Charger, the company wanted to impress and so it sent me the newer, shiny aluminum series model. But, I'm not swayed simply by the product's looks, though this charging pad is one heck of a looker. The Dual+Watch Aluminium Wireless Charger has a slim (8mm), round-edged rectangular base made out of one piece of aluminum and a watch charging stand protruding from it like a chrome shower head. Like the Samsung, the Zens charger offers fast charging, but instead of 7.5W it has up to 10W of charging for up to three devices: an Apple Watch Series 4 and earlier models and two Qi-enabled smart phones. While the Zens wireless charger may be able to offer 10W of power, most major smartphone brands don't accept that amount of charging power. (Only a relatively small number of devices will accept that level of charge, but they do exist.) Apple decided to on 7.5W for a "fast charge" and Samsung with 9W. At 10W, the Zens charger is optimized for any device meaning that whatever type of phone is placed on the charger, the right output is used. The Watch charging module is Apple MFi certified (necessary to create the electronic handshake with a tiny authentication chip in a watch), so it only works with the Apple Watch (all series). It won't charge an Android-based watch (or the Samsung Gear S3 Frontier we had in hand – we tried). An Apple Watch adheres to the stand through the Magnetic Charging Mode feature. As with the Samsung, I found the Zens fast wireless charger to have a liberal area for movement of a smartphone while still sending a charge. 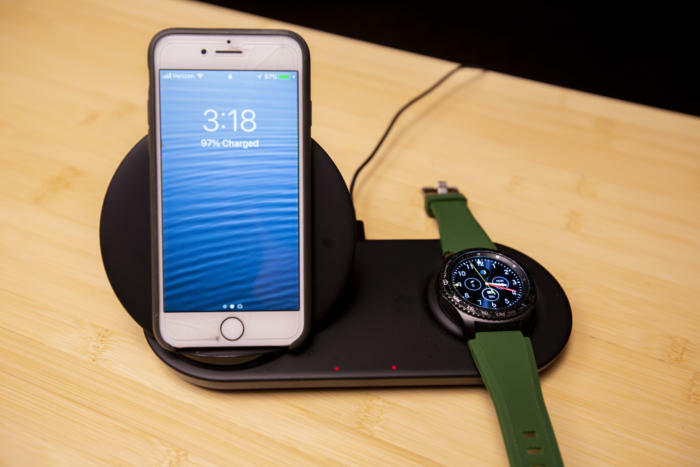 The charging post, of course, has a vastly smaller area than the pad – even more so than Samsung's – so you have to make sure your watch is properly positioned. While the watch charging post is hard aluminum, the pad is rubberized to prevent your smartphone from slipping around. Like the Samsung charger, the Zens device has two LEDs on the bottom front of the dock that indicate when a device is connected and charging; they're smartly directed downward so as to not be distracting from a bed stand and instead give off a soft hue instead of a harsh direct light. This also means they're harder to see from across a room. This charger is a solid product. Criticisms I have? I don't like the lack of a smartphone stand that allows you to watch videos or see incoming messages. I also think the form factor could have been better thought out; if you hang a watch on the charging post, the band hangs down over one of the smartphone charging surfaces. It's no deal breaker, but it's a little inconvenient. Lastly, the charging cord and power plug: I'd prefer a USB C-Type plug versus a proprietary one and I don't like that the power adapter is horizontally positioned; it covers up to two outlets on a power strip. Samsung designed its adapter smartly (it's vertical). While Samsung's charger carries a one-year warranty, the Zens Dual+Watch Aluminum Wireless Charger triples that time. A three-year warranty says a lot about the company's confidence in its charger. Overall, I really liked the Zens Dual+Watch Fast Wireless Charger. It's a great looking piece of technology made by a reputable company and it allows for up to two smartphones and one watch to charge at the same time - that's one more smartphone than the other chargers I reviewed can handle. You'll only find the Dual+Watch Fast Wireless Charger on Zens's site, where it retails for €99.99, or about $112. So, for the same price as the Samsung, you get an additional charging pad – but no upright smartphone charging stand. While the latest Qi wireless charging specification (v1.2) allows for up to 15W of charging power, it is the software on a receiving device that controls how much power is transferred from a charger to a device. For example, a charging pad might be able to emit 10W, but that's overkill for a device than can only take 7.5W, as it the case with recent iPhones. For there to be any increase in charging speed, both receiver and transmitter have to be able to operate at those higher power levels. Here's a good explainer on "fast wireless charging." And, even if a smartphone could receive 10W of power, it's not necessarily true that it would power up twice as fast as with a 5W charger; there are a lot of factors that influence charging time. There are currently 242 devices – both chargers and smart phones – that will put out or receive more than 5W of power, according to a Qi-certification database compiled by the Wireless Power Consortium's (WPC) website. Phone batteries can only be charged at the maximum rate between 10% battery charge and 70%, according to the WPC, the industry group responsible for Qi standards. Most phones will limit the power into the battery when the battery is almost empty and almost full. That makes it hard to predict total charging time from the rating of the power supply. "It is easier to see the effect of fast charging when you compare the time to charge a battery from, say 30% to 60%. A complicating factor is that a phone will reduce the charging power when the battery gets warm," said WPC Chairman Menno Treffers. "That adds to the unpredictability of charging times." Here's a good explainer on battery charging. The Belkin BOOST↑UP Wireless Charging Dock. Now, back to chargers. 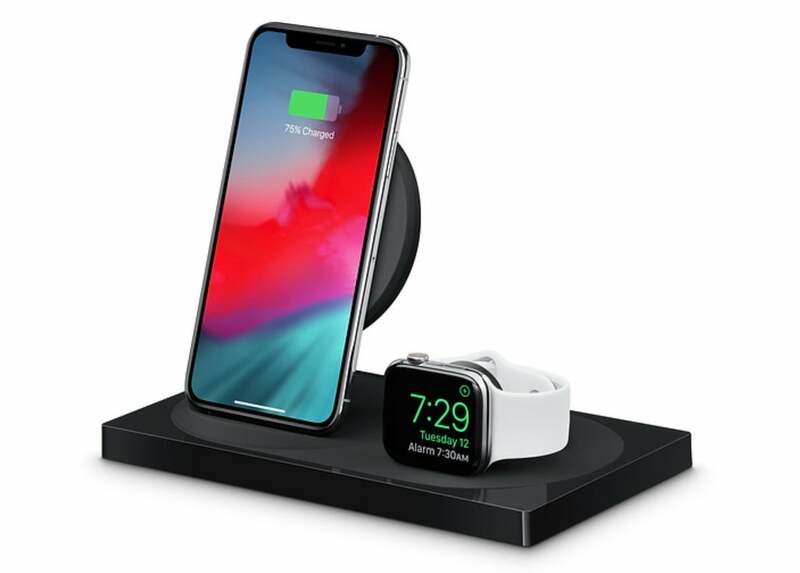 Next on the list is the Belkin BOOST↑UP Wireless Charging Dock for iPhone + Apple Watch, which, as the name denotes, is specifically made for the Apple iPhone and the Apple Watch. As it's Qi certified, the smartphone charging stand (separate from the Watch charging post, which emits 5W), offers 7.5W "fast charging" for iPhones. And it can charge any other Qi-enabled smartphone or tablet, though not at the 9W setting offered by many Android device receivers. 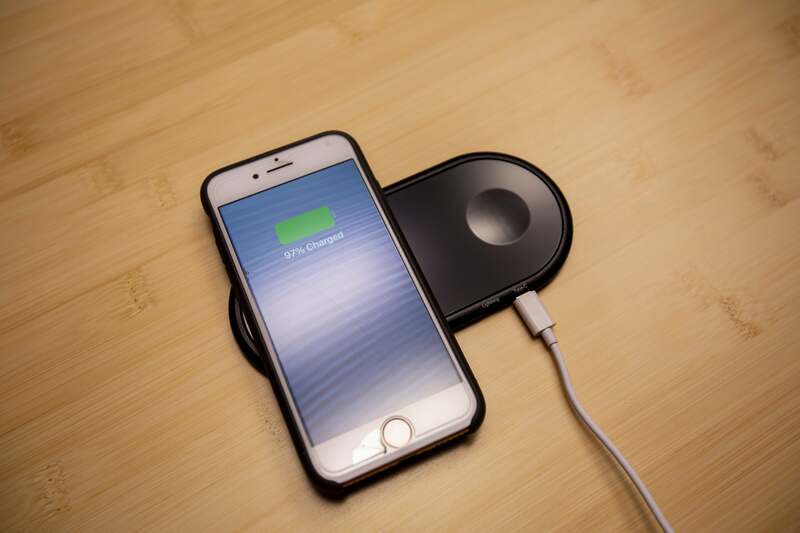 The Belkin charger is hard edged – a rectangle with an oval-shaped, rubberized surface on which the iPhone charging stand and Apple Watch charging post protrude. The charger measures 7.36-in. by 4.13-in., making it roughly the same size as the Samsung Wireless Charger Duo, though its slightly deeper by about ¾-in. As is true of the other chargers, Belkin's is good looking, with a clean, simple design. 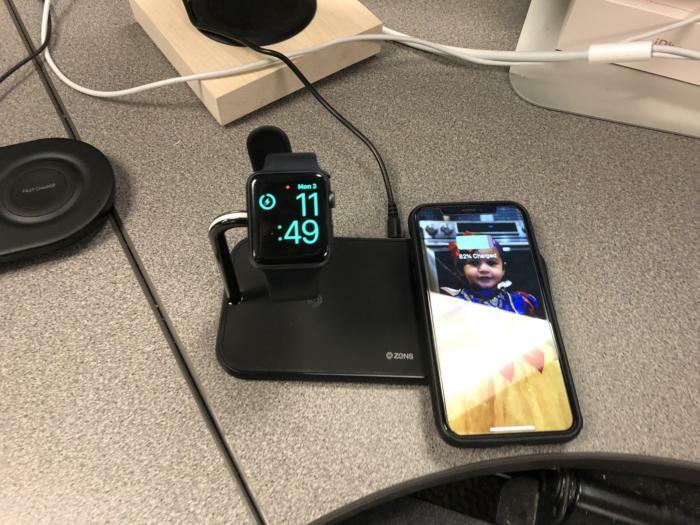 Unlike the other three chargers, the Belkin orients an Apple Watch on its side, and supports Nightstand mode to enable the alarm clock feature as it charges. The Belkin also sports an LED light that's supposed to indicate when an iPhone or Apple Watch is properly aligned and charging. For the life of me, I could not find that LED light no matter how many times I plopped my iPhone 8 down. Hopefully, that won't be an issue when the charger becomes more generally available. While this next criticism may seem minor, for people who use reading glasses, it's important. The directions, safety instructions, and warranty are written on a single sheet of paper in text so small, most people over the age of 25 will need a magnifying glass (and reading glasses) to see them; that's not particularly user friendly. Conversely, I could easily read every other charger's documentation. The Belkin BOOST↑UP Wireless Charging Dock comes in white or black and has a two-year warranty. Currently, it is only available on Apple's accessories website, but Belkin plans to begin offering it through its own site within a few weeks. The BOOST↑UP Wireless Charging Dock comes with a two-year warranty, and you get an additional year if you register the device. Overall, I liked the BOOST↑UP for its smartphone charging stand and its USB-A port, allowing a user to charge up to three devices from a single outlet. However, I didn't think this charger was as visually appealing as the others and it was less capable because it doesn't fast charge Android smartphones. Finally, with a $160 price tag, the Belkin charger is by far the most expensive of the four I reviewed; considering it's limited to working only with Apple devices, that high price doesn't seem warranted. This wireless charger caught my eye for its simple design and versatility. I wasn't familiar with the maker, ZealSound, whose main business appears to be audio equipment, but after searching its site (and Amazo)n I found several products with relatively positive reviews, especially for its earbuds. I'm not sure what to make of ZealSound itself. The wireless charger's packaging said it came out of Hong Kong from Xiaomi International Ltd., a private company incorporated in September 2016. Xiaomi International Ltd. doesn't appear to have a live website, even though it lists one on its Facebook page. What does all that mean? In two words: Caveat emptor. Still, the product is real and pretty darned cool. ZealSound's Dual Fast Wireless Charger is minimalistic and stylish. It's just an oval pad with a tempered glass surface; that's it. No markings. No charging posts. No smartphone stand. Yet, it has heft. For its small size – just 2¾-in. by 5¾-in. and 1/4-in. thick – it feels like a quality product. The charger has a lightning and USB C-Type connector in the rear. The charger comes with a 3.3-foot-long USB-A to USB-C cable but no electrical outlet adapter; you'll have to buy your own. This charging pad will only charge one watch (an Apple Watch or Moto 360) and either an iPhone 8 or newer or Android smartphone that's Qi-enabled. 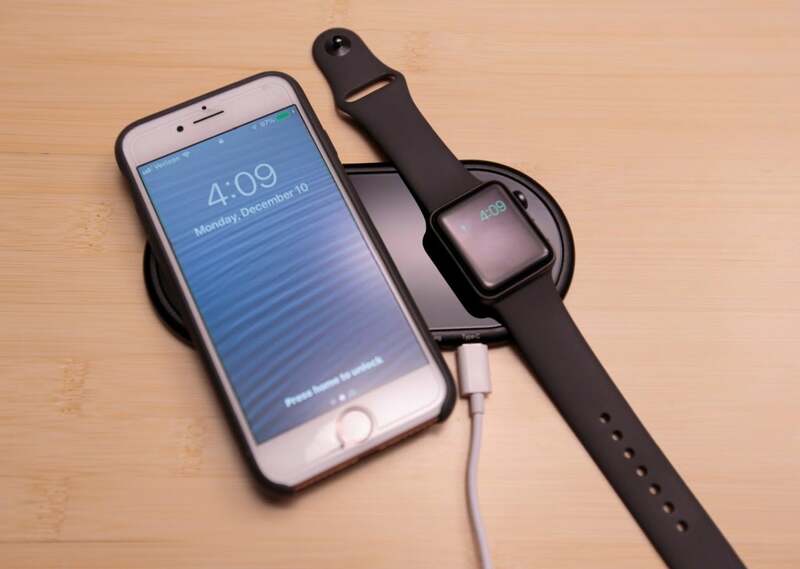 It offers three charging modes for smartphones, 10W, 7.5W and 5W; the first three generations of Apple Watches charge at 2.5W. It cannot charge an Apple Watch 4. ZealSound's Dual Fast Charger with an Apple Watch 3 charging on it. The ZealSound Dual Fast Wireless Charger's LED charging indicator light and the charger power turn off automatically when your device is fully charged. There's a round depression on one side of the charger to indicate where an Apple Watch should be placed to activate the Magnetic Charging Mode. The ZealSound wireless charger offers four color options for its bezel ring: black, red, silver or blue. The company claims the charger has an intelligent temperature control system to ensure cooler, more efficient, charging and it uses a "premium copper coil" for faster charging and heat dissipation. While charging my iPhone 8 and an Apple Watch on the pad, I didn't detect any heat build up. An exploded view of the ZealSound Dual Fast Charger, showing the two copper charging coils -- one for an Apple Watch and the other for a Qi-enabled smart phone. As ZealSound's wireless charging surface is only a flat pad, sans smartwatch charging post or smartphone stand, it's not ideal for receiving notifications or watching video while your devices charge. On the other hand, it will take up the least amount of side table or desktop space of any dual-device wireless charger out there. The company offers a "one year no hassle refund and exchange warranty" and 24-hour ZealSound Service apparently accessible either through Amazon.com or email. Having corresponded with ZealSound using their email, I can guarantee you it's not 24-hour service; the rep I was dealing with was on Hong Kong Standard Time during business hours. At just $40, the ZealSound Dual Fast Wireless Charger is the least expensive of the four I reviewed. Considering that you're buying from a start-up company, that's a good thing; it reduces your potential loss should something go wrong. While it only charges two devices at the same time (just as Samsung's does) and it doesn't come with an electrical outlet converter – only a USB cable – it's still a handy little device for what it is. If bedside table space is at a premium, this charger would fit the bill. While all four wireless chargers have some positive attributes, none of them do it all. That is, none of them will charge all of the Qi-enabled smartphones and watches now available. If you're tied to the Apple ecosystem, I recommend the Zens charger because it can charge two smartphones simultaneously and does the best job of positioning an Apple Watch. If you're not all-in with Apple, the Samsung device should meet your needs. The good news is there will be more of these chargers hitting the market over the next few months, making it easier to pick the one that's just right for you.